A few weeks ago, year nine students from 9JR decided it would be a brilliant idea to donate various food items to the local food bank at Louth Trinity Centre, where all the products donated go to help the less fortunate. The students not only donated their own items, but also encouraged other students and staff members to donate to their cause by creating and putting up posters advertising their food bank across the site. Because of their efforts and enthusiasm, in just a mere two weeks they managed to gather all of the items shown in the photo below! This was then taken to the Trinity Centre last Wednesday to be donated. So, if you have any extra tins of soup or a bag of pasta hanging around the cupboard, please feel free to donate it and help continue their food bank collection! 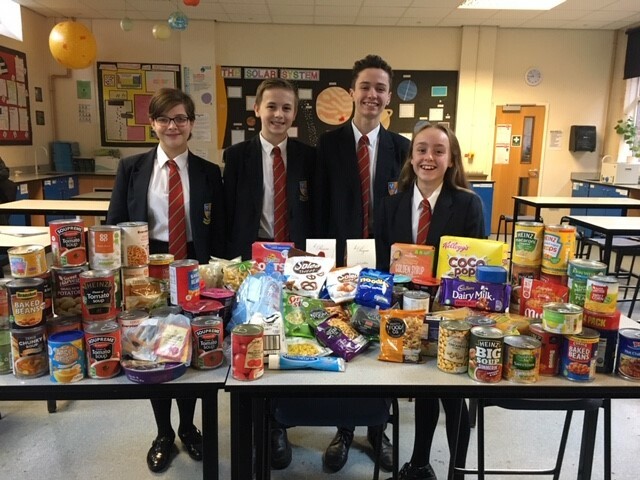 The photo above shows Ellie Arnett-Briggs, Charlie Coxon, Ben Thomas and Hannah Forman with the first batch of donations for the food bank.